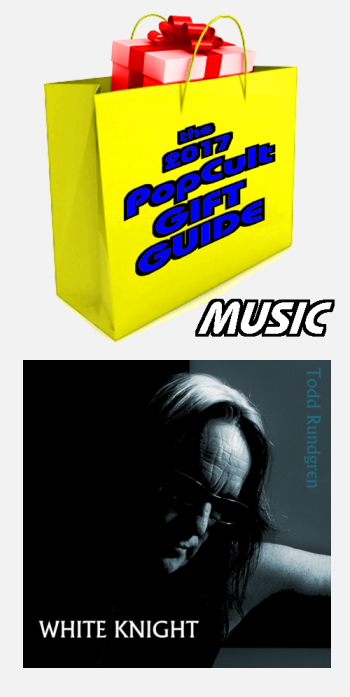 Today’s music pick in the 2017 PopCult Gift Guide is the newest album by music legend, Todd Rundgren. White Knight is a collections of collaborations with a wide variety of musical acts. Any fan of Rundgren’s will fall head over heels in love with this album. It’s got hints of every aspect of his career, and still points to the future. White Knight showcases Rundgren’s incredibly diverse range of styles from soulful art rock to ambient synth pop and includes performances from Rundgren’s equally diverse musical companions such as Trent Reznor, Donald Fagen (of Steely Dan), Joe Walsh (of The Eagles), Daryl Hall, Dam Funk, Joe Satriani, Robyn and others. Includes the tracks “I Got Your Back,” “Chance for Us,” “Tin Foil Hat,” “Sleep,” “That Could Have Been Me,” “Deaf Ears,” “This Is Not a Drill” and others. I’ve had three of those tunes in heavy rotation on The AIR, and as a sign of how incredibly talented a producer/performer/musician Rundgren is, he even has me liking a song he performs with Donald Fagan of Steely Dan. Longtime PopCult readers may remember that I have a long and inexplicable aversion to the music of Steely Dan, but the Trump-baiting “Tin Foil Hat” is a masterpiece that does not provoke a Pavolovian response in me, even though it sounds EXACTLY like Steely Dan at their most Steely Dannish. Isn’t that cool. This is a great album for any fan of Rundgren, or classic rock in general, and it’s certain to put a smile on the face of anybody who is disgusted by the current occupant of the White House. You can find it at any retailer that sells new music, or go look in the Amazon machine.